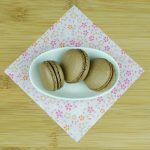 These delicate, adorable Italian style macarons are a delicious, chocolaty treat. They pair perfectly with espresso or tea, for a beautiful afternoon treat. In large bowl, sift together the almond flour, cocoa powder, and powdered sugar three times, making sure there are no lumps, and the mixture is even in color. Mix in the 105 g of egg whites. Continue to mix until a dough like consistency is reached. Set this mixture aside. Once the cookies are done slide the parchment paper off the cookie sheet, and let rest for at least 5 minutes. Gently peel each shell off the paper, and match with an equal sized partner. Let the cookies cool completely before filling with your favorite ganache, icing, or chocolate filling. I simply filled mine with melted dark chocolate.